MODARTT has released two new add-ons for use with Pianoteq: a Conrad Graf (1826) and a Johann Schantz (1790), two pianoforte built in Vienna. They complement the two other pianoforte already available: a Donat Schöffstoss (1812) and a Johann Evangelist Schmidt (1790). These four pianoforte represent the important period of piano music around 1800, and are located in Kremsegg Schloss museum, Kremsmünster, Austria, and Handelhaus museum, Halle, Germany. 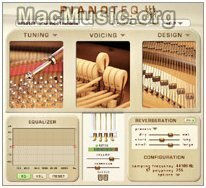 These add-ons are offered for free for use with Pianoteq. They are created in the frame of the non profit cultural project KIViR (Keyboard Instrument Virtual Restoration) which concerns historic keyboard instruments museums. On a long-term basis, MODARTT aims to build an important collection of digital copies of historic instruments from all parts of the world, serving as maintainable testimony of the past.